NFL Adderall: The study drug isn’t helping football players do anything but get suspended. Adderall isn’t helping football players do anything but get suspended. 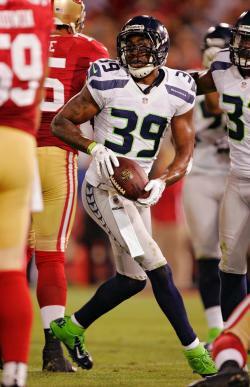 Cornerback Brandon Browner of the Seattle Seahawks celebrates after intercepting a pass. Photo by Brian Bahr/Getty Images. When word came down Sunday that the Seattle Seahawks’ starting cornerbacks, Brandon Browner and Richard Sherman, were facing four-game suspensions for using performance-enhancing drugs, the natural reaction was: Aha. Browner and Sherman came from nowhere—they were, respectively, a CFL free agent and a fifth-round pick—and almost instantly became key parts of the league’s second-best defense. So it wasn’t magic, after all. But then more news came out: The pair had reportedly tested positive not for steroids or testosterone or human growth hormone, but for Adderall, the ADD-treatment pills rich high-school kids pop to finish research papers. As an amphetamine, Adderall falls under the league’s list of banned performance-enhancers, but no one expects mere Adderall to turn two scrubs into all-stars. So the logic took its next step: Browner and Sherman had to be lying about what they had actually tested positive for. This line of reasoning didn’t begin with the Seattle pair. At the end of July, when Giants safety Tyler Sash was grumbling about his four-game suspension, Mike Florio laid it out: Confidentiality agreements prohibit the NFL from disclosing what actually shows up on a player’s drug screen. So the specifics are supplied through back channels, by unnamed sources. And lots of players, per unnamed sources, have “tested positive for Adderall.” Yet some players who claimed they could produce legitimate prescriptions and doctor’s notes for Adderall never had their suspensions revoked. (And, besides: Adderall? Why would professional athletes take that? Never mind that athletes have been taking chemically similar greenies for decades.) So, Florio suggested, the anonymous tales of Adderall positives may just have been a cover-up for positive steroids tests. Our own Barry Petchesky wrote something similar. The season came, and so did many more apparent Adderall suspensions. The league hit Browns corner Joe Haden, then Giants safety Will Hill, then Bucs corner Aqib Talib, then Bucs corner Eric Wright, then Falcons lineman Joe Hawley. And then it got Sherman and Browner. Bill Simmons started flogging Florio’s theory on Monday. Now there were many so-called Adderall positives. Clearly they had to be scams! But there’s another explanation, one which a source at the players’ association confirmed to us: Players are, in fact, testing positive for amphetamines more frequently than they have in previous years. (We say “amphetamines” because a player can’t test positive “for Adderall”: Adderall is a brand name for one type of amphetamine, and the NFL’s drug screenings don’t register which particular drug a player took.) Nationally the drugs are as popular as ever: There’s even an Adderall shortage dating back to last year. There’s no reason to expect use to tail off. Prescription amphetamines have medical uses and quasi-medical ones, enhancing the performance of people with decidedly non-contact jobs. (There are at least three people within 10 yards of my desk who routinely pop unprescribed Adderall at work.) And prescription amphetamines have party uses too. An Adderall high lasts longer than a cocaine one, and the drug, with its test-prep-in-a-bottle credentials, isn’t quite so transparently dangerous. The NFL classifies stimulants both ways, as drugs of abuse and as performance-enhancers. Does Adderall actually improve an athlete’s performance? It’s hard to tell. Matt Fedoruk, the science director of the United States Anti-Doping Agency, told us in an email that stimulants can increase alertness and motivation and reduce fatigue. Naturally, about 10 percent of Major League Baseball players have acquired therapeutic use exemptions for Adderall—it helps players overcome the monotony of the season, day games after night games, and the like. But the NFL doesn’t really demand the same pick-me-up against tedium. There’s only one game a week. Nor does the NFL require the same level of focus and hand-eye coordination that baseball does. Our source at the players’ association told us that the players who have tested positive have, by and large, used the drug when out partying. NFL players are tested year-round, and the tests can take six to eight weeks to process—meaning that most of this year’s Adderall positives have come from tests taken during the offseason. The Browns’ Haden reportedly used it to stay up all night in Vegas. Sherman and Browner don’t offer particularly vivid explanations for how the drugs wound up in their systems—USA Today quotes sources saying Sherman drank from a bottle which had a crushed-up pill added to it (Sherman denies it), and Browner claims his sample was tampered with—but they don’t need to. Whatever they did to test positive, they did it earlier in the season, before the most recent burst of news about positives. So far, there’s no evidence of either a conspiracy or an Adderall epidemic. What there is is a party drug that happens to fall under the NFL’s more stringent performance-enhancing-drug rules. Players with no prior offenses aren’t given individual random tests for recreational drugs during the offseason, but everyone is subject to year-round tests for performance enhancers. And the penalties are harsher too: First-time offenders with drugs of abuse are directed to a treatment program, and not suspended till there’s a second positive test. The first positive test for a performance-enhancing drug brings a four-game suspension. That means that even if they’re innocent of any competitive nefariousness, Sherman and Browner will almost assuredly not have their suspensions reduced when their appeals are heard next week. But perhaps there’s now a message for the long run—the Adderall classification gives the NFLPA something to bargain about next time the league wants to expand testing for true performance-enhancers. In the meantime, though, NFL players should stick to old-fashioned stimulants when they go out. Cocaine, ecstasy, even bath salts. Just no pharmaceuticals.